The Woman Up! Summit is in its second edition and will be held from 27-28th October 2018 at Jawahar Kala Kendra, Jaipur. The main purpose of the summit is to bring out the change through the stories from passionate individuals and inspiring leaders from across various fields to share ideas and attempt to change common perceptions regarding women joining the workforce. The sessions and workshops will focus on re-establishing the belief that women today have the ability to make a difference to their own lives. It will also give an opportunity for real-time engagement with the participants through mentorship sessions. 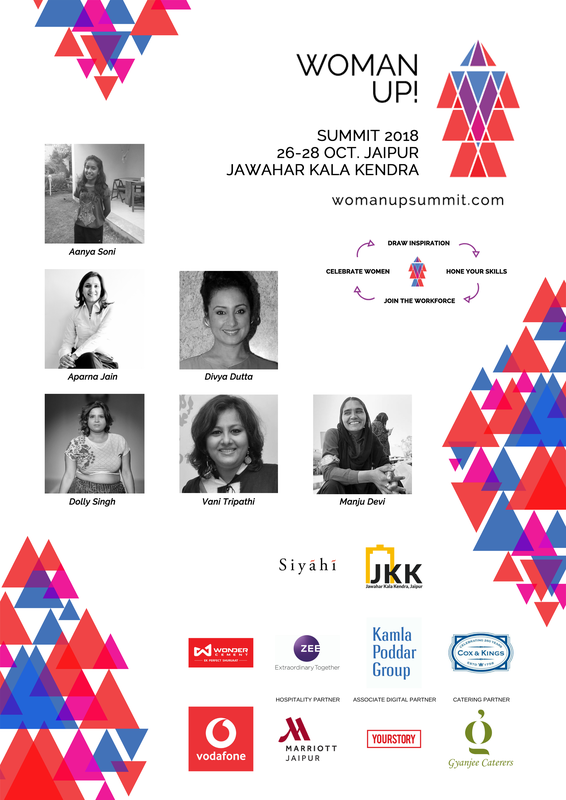 Some of the speakers for the summit include Ajaita Shah - Founder / CEO of Frontier Markets, and Frontier Innovations Foundation, Aparna Jain - author of Own It: Leadership Lessons from Women who do, Girls Like It and a leadership coach, Manju Devi - the first female coolie of entire Northwestern railways region,Aanya Soni - the youngest Indian to have gone to Antarctica for the 2041 Expedition with Robert Swan, Ashwin Mohan - founder, Lightning Fist Karate on self-defense, Dolly Singh- plus size yoga practitioner, Sabika Naqvi- founder of Sar-e-Rahguzar a movement to bring poetry onto the streets and gender rights activist, Shilpa Sharma - the co-founder of Jaypore, Shreyasi Goenka - co-director of Saat Saath Foundation, Kaveri Lalchand - CEO, K Clothing, Major Dr Meeta Singh - Chairperson of Dignity of Girl Child Foundation, Nisha Chauhan, Leela Devi, Nirupa Rao - Botanical Illustrator, Tejaswani Gautam - Deputy Commissioner of Police, Jaipur Commissionerate, IPS, Nirmala Kumari and Suman Kumari from Women Patrolling Unit, Radhika Sharma, director of Jeevan Ashram Sanstha, Kalpana Palat and Kalpana Bilwaal, members of Jeevan Ashram Sanstha. In 2017, Siyahi launched the Woman Up! Summit - a platform that inspires, aspires and encourages women to forge their path towards economic empowerment. Last year, twenty-five speakers from different walks of life came together to share their life experiences and lessons (Youtube). From body positivity to rejoining the workforce post-sabbatical, it was a well appreciated and attended. We had over 1200 young girls and women attend looking to be inspired to enter the workforce, dream big, start their own enterprise.